PA package featuring 3-way Gemini GSM series speakers. These premium Phonic PA packages make it easy to get started quickly with everything you need to hit the stage. We’ve done all the work for you and hand-selected the components for optimum performance. 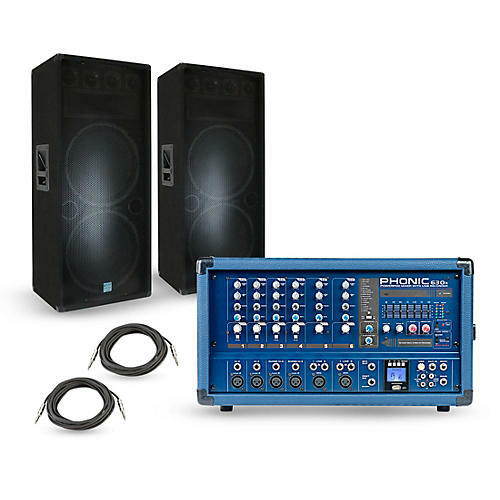 Each package delivers your choice of a pair of 12, 15 or dual 15" full-range passive speakers, a Phonic Powerpod 630R powered mixer and a pair of speaker cables. No matter your choice, each package is loaded with high-end technology and components for a powerful live performance. Boasting durable construction, precise audio reproduction and impressive power handling, GSM series passive speakers offer economical and versatile solutions for DJs and musicians in a wide variety of venue spaces. Consisting of 12, 15 and dual 15", 3-way models, the GSM lineup delivers robust, full-range sound that’s clear, detailed and accurate. To ensure quick, easy setup, the GSM series offers dual ¼ inch input jacks, as well as push-button connectors. Plus, durable wood construction and resilient carpet covering provide a roadworthy design that will withstand the rigors of heavy touring or demanding install environments. Get set for the stage—order today.